97.9 WHAV FM is the only Haverhill-based news source. 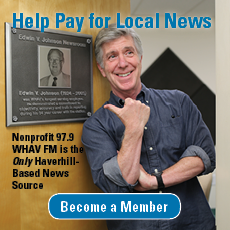 Original local news coverage and major stories reported first have already made non-profit WHAV the primary daily local news source for thousands in Haverhill and all surrounding communities. 97.9 WHAV complements the more than 10 million monthly “hits” (more than 100,000 “unique visitors”) and online listeners at WHAV.net and public access television stations in Andover, Haverhill and Methuen, Mass., and Atkinson, Plaistow and Sandown, N.H. Certain broadcasts also air with video at www.WHAV.TV. 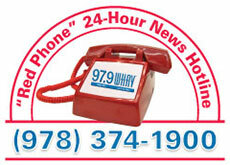 The earliest use of the WHAV call was July 22, 1922 in Wilmington, Del. It was one of the first 100 broadcast radio stations licensed in the US and changed to WDEL in 1926. Later, the Haverhill, Mass. Police Department began using the call letters for its shortwave radio station. The call’s entrance locally was conceived during World War II in the offices of The Haverhill Gazette, a daily newspaper serving what was, in the middle of the century, a shoe-manufacturing center 30 miles (48 km) north of Boston. The Gazette, as early as 1944, planned an FM radio station, but had to wait for the end of wartime controls on new construction. In its application to the Federal Communications Commission (FCC), The Gazette sought authority to construct a 300-foot (91 m) tower on Ayer’s Hill, the highest point of land in Haverhill. The station would transmit at a frequency of 46.5 megahertz (a frequency then assigned to FM) and use a 1,000 watt Western Electric (AT&T) transmitter. At that time, Western Electric operated a manufacturing facility in the city. Russ predicted the station would cost $30,000 to $50,000, operate eight hours-a-day at the start and employ 11 people. One of the first delays in moving the station forward was a debate over the location of the tower. The Gazette indicated its selection of Ayer’s Hill was second to Silver Hill, a more centrally located city-owned parcel. 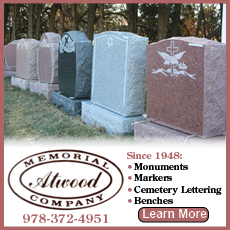 Mayor Glynn and some alderman were willing to sell or lease the Silver Hill site, but others held out for using the site as a war memorial. J.R. Poppele, chief engineer of WOR, New York, conducted the original survey of sites. The Gazette ultimately bought the Silver Hill site at auction and the FCC conditionally granted the license Dec. 10, 1945. The war memorial, incidentally, was not constructed for another 40 years and was placed at another location. A major blow to the FM project came, however, when the FCC moved FM’s spectrum assignment from the 42–50 megahertz band, allocated just before the war, to the current 88–108 megahertz band. This had the effect of rendering 500,000 receivers obsolete. The Gazette responded by filing an application for a 250-watt AM station. “Mr. Russ said establishment of an AM station for local coverage does not mean the company has abandoned plans for its FM station. It was decided to apply for an AM station when it became apparent facilities were not going to be developed as fast as first believed possible for FM stations. The company plans to operate the AM station in conjunction with (what would now be a 20,000 watt) FM station when the later station is set up,” the newspaper reported Aug. 2, 1946. The WHAV tower site, circa 1947, atop Silver Hill in Haverhill Massachusetts. The bottom section emitted the AM band signal, while the top mast was reserved for “bays” for future FM broadcasts. Designed to be WHAV's first studio, this building wasn't ready for the inaugural broadcast. The following month it was announced impressive art deco studios would be constructed in downtown Haverhill, while a transmitting building would be built on Silver Hill. 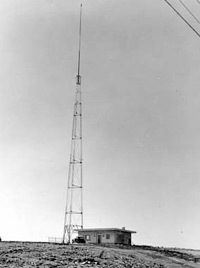 The first 160 feet (49 m) of the tower would be for AM transmissions at 1,490 kHz, while an isolated 80-foot (24 m) mast on the top would be erected for later FM transmission at 96.1 MHz. 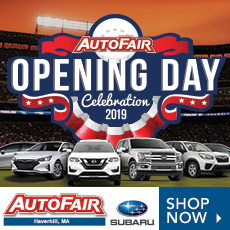 James B. Dunbar, commercial manager of the station, said The Gazette reached agreement with the City of Haverhill to swap its approved call letters, WHGF, with the police department’s radio station, WHAV. 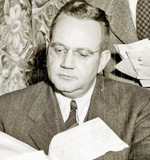 Al Taylor, recruited from WCAU Philadelphia (present day WPHT), and a former newspaperman who had interviewed Adolf Hitler, would become the first program director, and Herbert W. Brown became chief engineer. With transmission facilities completed, the inaugural broadcast of the AM station was set to take place March 16, 1947 from temporary studios downtown. Programs that day included a drama, “One Way Ticket,” starring Fred Waring and Myrna Loy. The new studios, designed by local architect Clinton F. Goodwin, would be ready later that year. 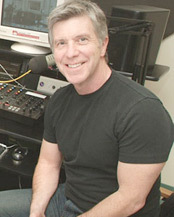 In an interview during the early 1980s, Goodwin admitted he toured other stations, including WEEI Boston (now WEZE) to determine how best to design the studios. That may explain why the station’s facilities convey a 1930s appearance. 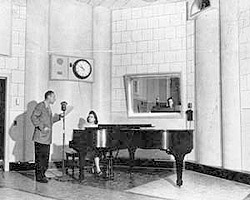 The new one-story studio building contained two large studios — one containing the requisite piano — and a small announcer’s booth. There was also a large lobby with a double-paned window looking into the largest studio. 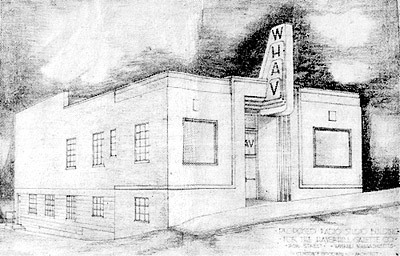 WHAV-FM finally went on the air April 14, 1948. WHAV-FM, as was the custom of the day, simply simulcasted the AM programs. Despite its earlier frequency announcement, the FM station occupied 92.5 MHz on the dial and is today known as WXRV. 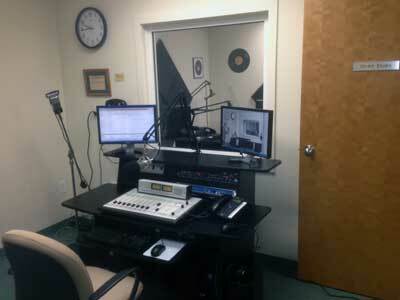 “FM broadcasting opens a new era for radio in Haverhill. It will give WHAV a second voice and will reach out into homes within a 50-mile radius of the city,” The Gazette announced. New hires during this time included a young Phillips Andover Academy graduate, Phil Christie (who is still heard on WHAV) as a disc jockey, and Paul A. Hurd as chief engineer. WHAV AM and FM joined the Continental Network, whose key station was WASH in Washington, D.C., in time for President Harry S. Truman’s inauguration. The stations were the second in Massachusetts to become associated with Continental and the eighth in New England. Vaughn Monroe made an appearance on the stations during the grand opening of the new studio building to promote what would be a Big Band format, said Jackie Natalino, daughter of Russ and former music librarian, during a 1978 interview. On Sept. 29, 1950, WHAV announced it would join “the Liberty Broadcasting System — third largest network in America.” Liberty Broadcasting System began in 1948 with 42 affiliates and offered a sports format. It was operated by “The Old Scotchman,” Gordon McLendon, out of KLIF, Dallas, Texas. McLendon and Ted Husing handled all football broadcasts for the network. McLendon, who pioneered radio’s transition into the television age, also hosted a show, “Great Days in Sports,” which recreated great sports events from the past. WHAV joined Liberty just as the nationwide network grew to 240 affiliates with 10 hours of programs a day. At its peak, Liberty had 458 affiliates, but folded in 1952. It was a difficult time for radio, and WHAV-FM was not exempt. Popular WHAV personality Ken Ash in a publicity photograph. 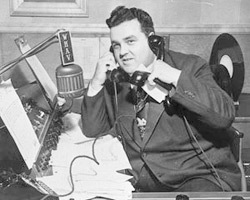 In the banner photograph at the top of the page, Program Director Warren Greenwood poses in the announcer’s booth June 21, 1948. The FCC also placed restrictions on simulcasting, requiring more of FM programs to be original and adding substantially to programming costs. As debts mounted, former News Director Edwin V. Johnson recalled, most of the staff was released. That left Johnson and an engineer playing all taped programs from the newly introduced Presto-brand commercial reel-to-reel tape recorders. Johnson, who joined the station in June, 1951, changed his status to part-time, but remained until his retirement in 1985. WHAV-FM was dark by 1953 and its transmitter ended up 30 or so miles away at WCRB. The virtually insolvent WHAV AM was sold in 1954 to Edward I. Cetlin and Henry R. and Morris Silver. The Silver brothers were owners of a successful Manchester bottling company and former owners of WFEA, Manchester, N.H., and WKXL, Concord, N.H.
WHAV’s Technical Department was equipped with the latest technology of the day. 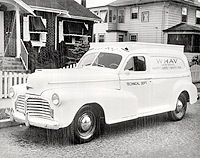 Free for the asking, WHAV AM’s new owners would revive a 20,000 watt WHAV-FM at the 92.5 MHz frequency in 1959. Stereo did not come until the 1970s for WHAV-FM when it aired the automated “Music Just for the Two of Us” format from Peters Productions. A power increase to an “effective radiated power output” of 50,000 watts was partly financed by a Rhode Island station on an adjacent frequency as a condition of its own power increase, as former Chief Engineer Ted Nahil once remarked. Tom Bergeron, who would go on to host “Hollywood Squares” and “America’s Funniest Home Videos” and, more recently, “Dancing With The Stars” got his start on WHAV in the mid-1970s. Former WEZE personality, Earl “Mr. Midnight” Gynan, also joined WHAV during this time. In 1981, WHAV AM and FM were sold to Northeast Broadcasting Company in a distress sale stemming from an FCC investigation into equal employment opportunity issues. The FM station went on to become WLYT and later WXRV. That owner is now known as Beanpot Broadcasting Corp., a Delaware corporation with principal offices in Bedford, N.H.
WHAV (AM) was turned over to Eastern Media of Methuen, Mass. in 1995. Eastern Media became known as Costa-Eagle Radio Ventures Ltd. when the owners of the Eagle-Tribune bought a 49 percent stake in the company and returned to broadcasting (the company previously owned WLAW and WLAW-FM). Costa-Eagle would go on to purchase WCCM from Curt Gowdy Broadcasting Corp. Similarly, the owners of the Eagle-Tribune formed ETP Ventures Inc. in 1998 and purchased the Haverhill Gazette. Ownership of WHAV and the Haverhill Gazette had come full circle. WHAV would dub itself “Radio Impacto” and air Spanish-language programs. WXRV changed its city of license to Andover, Mass. in 2005. The end of the WHAV call on 1490 kHz came on Sept. 8, 2002, when WCCM moved to the frequency, WNNW moved to WCCM’s 800 kHz frequency and WHAV’s programming moved to WNNW’s 1110 kHz frequency and became known as WCEC. During the summer of 2007, another frequency swap occurred and WCCM moved to 1110 kHz and WCEC moved to 1490 kHz. In a series of legal filings, the right to the WHAV name was assumed by COCO+CO., Inc., and the station returned to English language programming as an Internet radio station Jan. 3, 2004 at WHAV.net. Since that time, a number of cable television stations have also agreed to carry its locally-oriented programming. WHAV also broadcasts at low power on 1640 AM for the Haverhill area. The Eagle-Tribune and its associated ventures were sold in December 2005 to Birmingham, Alabama-based Community Newspaper Holdings Inc., leaving the new WHAV as the last 100 percent locally-owned medium in the region. In 2011, WHAV was spun off to a new, nonprofit corporation—Public Media of New England, Inc. A year later, upon the closing of the Eagle-Tribune’s and Haverhill Gazette’s downtown Haverhill offices, it became the last locally based news medium. WHAV filed an application with the FCC during the fall of 2013 to return to the airwaves as an FM station. It signed on at 97.9 Sept. 21, 2016. WHAV is affiliated with the Pacifica Network, the nation’s oldest public radio network. The station continues to grow and present local programs such as the Open Mike Show, local news, Community Spotlight and more. 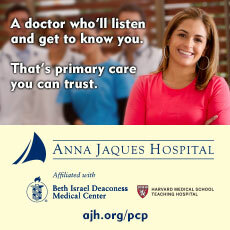 It is now listener- and underwriter-supported public media.